I'm on Day 5 of participating in the America's Giving Challenge. My goals are to raise money for the Sharing Foundation, share stories about the Sharing Foundation and its supporters, and share what I'm learning about using social networks to raise money as an extra organizational activist on my blog over the course of the 50-day giving challenge. 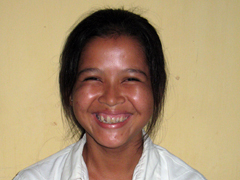 Most of you have read about Leng Sopharath, the young woman who my family sponsors for college. The Sharing Foundation's education programs provide a route out of poverty long before the children reach college. The Khmer Literacy school is a part of the Sharing Foundation's Farm Project, started in 2001, when the village chief advised Sharing Foundation that help for the poorest families—families living out in back of the main village, without money to rent land or buy tools or seeds—was the most urgent need. Most of the parents in the project have very little or no schooling, and most cannot read or write. The children, of varying ages, cannot just jump into the village school so Sharing Foundation built a simple thatched two-room schoolhouse on the edge of the farm fields. Initially, the parents balked, saying their children would grow up to be farmers, and needed no schooling. Gradually, however, under two good teachers, parents have become incredibly proud of their children’s accomplishments as they learned reading, writing, and math. We now have three sessions a day, and many of the children as they have become skilled also go to the half-day village school, with their parents’ approval. I was complaining to myself about how hard it was to raise money. While fundraising on the social web may appear to be easy to set up, it takes work. You have take a leap of faith and you have keep optimistic. When I think of the hardships Chheng Srey Mom and Leng Sopharath have to overcome, I have no business complaining. We're making slow progress, but making progress and I'm so grateful for the support. I used to think poke was annoying, but my friends poke when they recruit or donate. Now, I love it. 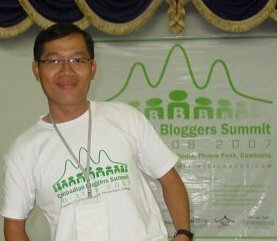 I'd like to thank my Cambodian blogger colleagues who have embraced this cause and recruited their friends. Mean Lux, Mongkol, Vuth Bora, Virak, and Kaylan Keo. They've recruited their friends to the cause, so what is really cool is that I am connecting with some awesome young people in Cambodia who helping children in their country. I now understand what Connie Benson meant when she said "Meet people as people first." I really understand Connie after submerging. Today I made a connection with a friend to something of mutual interest and she joined my cause and donated too. In the interest of full disclosure and transparency, the pr person who sent me the bag, made a donation to the Sharing Foundation because they loved the video. Kudos on your efforts Beth! and yes, meeting new people is a wonderful adventure you never know what path it will take you down.